Ultra fine 14.34 carat Aquamarine emerald-cut , from India, exhibiting a very rare vivid blue color and superior clarity. 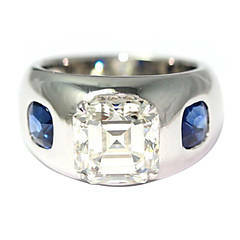 This magnificent gem is a one of a kind classic item for a custom tailored cocktail ring. Extraordinary Aquamarines of this quality, from India, are immensely rare and coveted.